Open this umbrella up and behold: a blue sky with fluffy white clouds. In 1992, it rained just enough to make designers Tibor Kalman and Emanuel Frattini stick it to the grey skies and say, "I'll make my own sunshine." 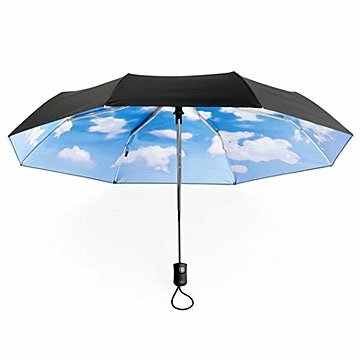 This replica of the original Sky Umbrella looks like your average black shield when collapsed, but open it up and behold: a blue sky with fluffy white clouds. The simple yet clever design transports you from a rainy day to a day in paradise. Just try not to look down. Created using sturdy nylon that easily opens and closes into a compact size. Made in China.